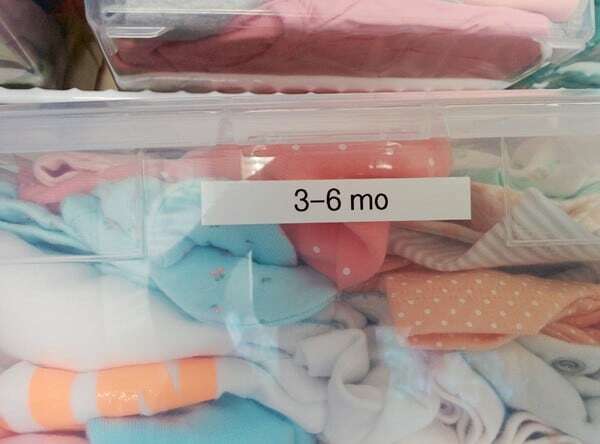 When you’re organized, things just seem to run more smoothly! Nobody needs to panic when they can’t find something because it’s been established ahead of time that every item has a place. 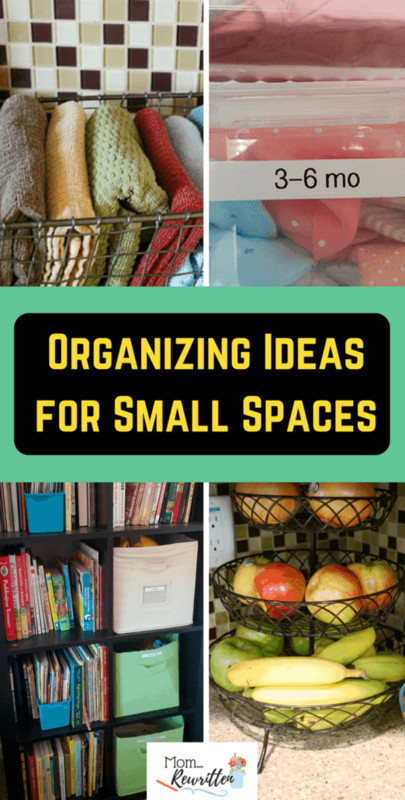 Organizing solutions for small spaces do not have to be expensive. There is no reason to hire “experts” or purchase pricey dividers or shelving units. It does take time though, arranging items to the best benefit and use of your family. 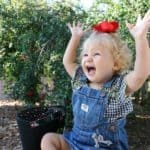 But it will be all worth it when someone asks you, “Where’s my red hat with the white polka dots?” and you’ll know exactly what to tell them so they can find it! There are 6 of us in our 1000 square foot home. Yep, that’s a tight fit and every inch counts. Since adding our newest little one, we’ve been organizing and streamlining the house to make room. We’ve always done pretty good with keeping stuff to a minimum but some of our stuff is necessary. It’s all about finding the most practical way to store it in a budget-friendly way! 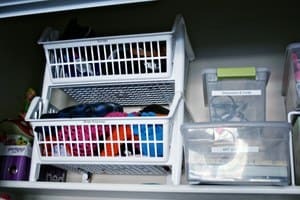 These are my top 12 organizing solutions! When we moved into our small home four years ago I had things pretty well organized. But over time our needs changed and I hadn’t rethought certain areas. I knew that we could do better and get them even more organized and streamlined. I took a good look at each space I needed to reorganize and made notes. In rethinking some of these spaces, I knew that I could move things there into other locations or even get rid of them completely. Before you even start to organize, you have to decide what you’re going to keep and what needs to go. Remove the contents of a drawer, bin or closet and go through each and every item. Toss out, recycle, donate or place in a garage sale pile…whatever you need to do to minimize. Go through medications, lotions, nail polish, and other household items frequently to toss what is expired or give away what isn’t being used. 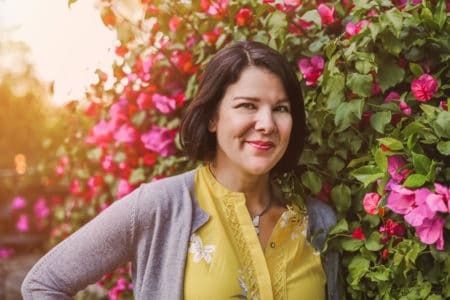 Add this task to your calendar once each season and it won’t be such a laborious project. I keep a small basket or fabric box (less than $5 each on Amazon) inside my kid’s closet for donation items. As they outgrow their clothes, I place the items in the basket. When the basket is full the contents are given away. 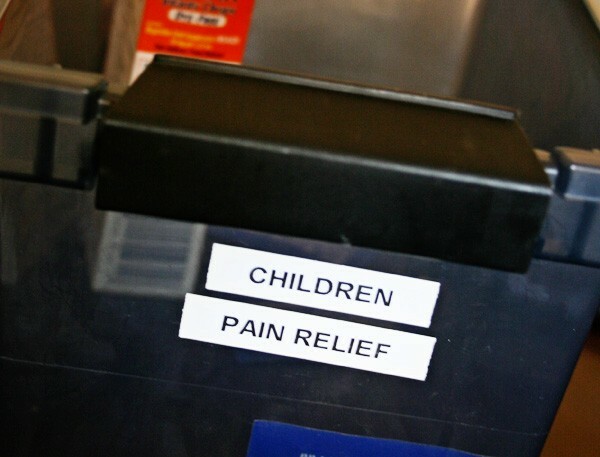 We make use out of our closet by keeping overstock items and medical needs clearly labeled in bins and drawers. We don’t have a junk drawer. We don’t need one because in our small home, there is no room for a “junk drawer”…everything has a place! Dump out your junk drawer and find a home for each and every item there. Batteries? Get a bin for them and store them in a desk. Pens and pencils? 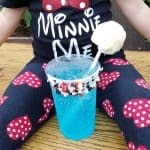 Keep them in a cup within easy reach. Mail? Deal with mail as it comes in the door, recycling or filing as necessary. A mesh desk organizer (Amazon for less than $10) is a great place to keep some of these “junk drawer” items you need close at hand. I just splurged and bought a new Brother P-Touch Label Maker (less than $23 on Amazon) and have been going (slightly) overboard with labeling everything in the house. However I will note that nobody has been asking me, “Where’s the XYZ” because everything is so neatly labeled for them now! I do recommend investing in a label maker but you could also purchase stickers and label boxes with a Sharpie as well. Organize drawer contents and sort into “like items”. 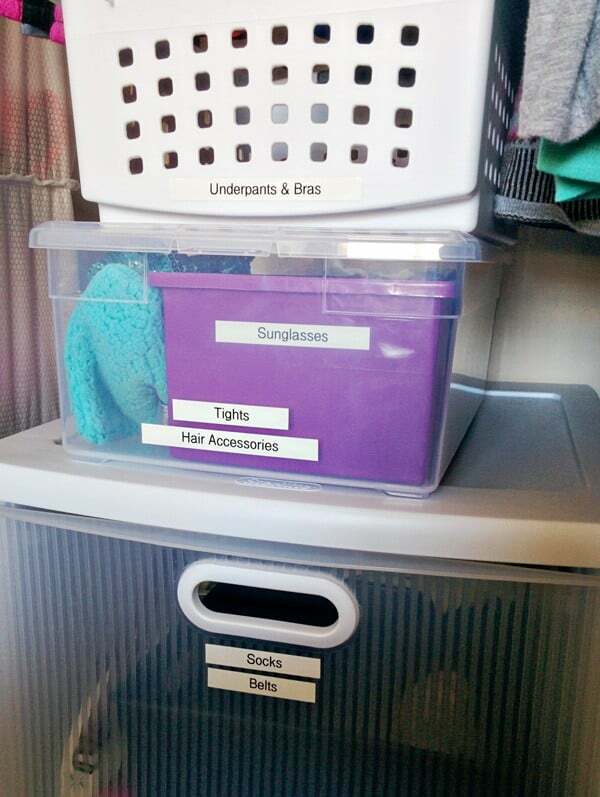 Add a label on the outside to remind family to put things back where they belong! Labels on book shelves help young readers organize their picture books, chapter book and coloring books. Sort important paperwork into 3-Ring binders and then add a label to the side for easy access. 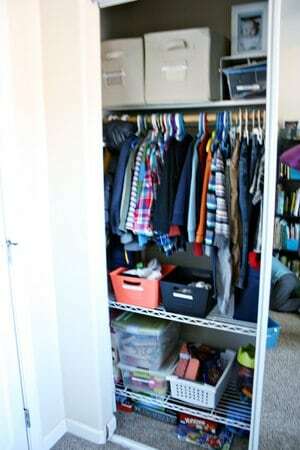 We’d all love to get those fancy professionally sized closet organizers, right? But boy, are they pricey!! We found a more reasonable solution in metal shelving units. They are intended for the garage I think, but we like to think outside of the box. Since some of these tall Steel Wire Shelving Unit (under $40 on Amazon) can be customized for shelf height, they are perfect for placing in your closet. We simply keep the units as two shorter racks instead of assembling into one tall rack. Things sitting on the floor can pile up and add to the clutter. 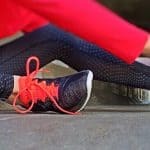 Look at what you have on the floor and figure out where you can put it so it’s off the ground. I have a hook in the hall closet with a pair of scissors so everyone knows exactly where the scissors are (instead of tossed in a random drawer). Backpacks go on hooks in the garage. Tired of seeing the bath towel laying on the floor because your little one can’t hang it properly on a towel rod? Install a hook! We were limited on wall space so my husband hung bath towel hooks for the boys on the end of the bunk bed and that works perfectly because they are completely out of the way. An Over The Door Hook is invaluable (and under $15 on Amazon) and can make use of space, especially in a bathroom for towels. No need to put holes in the wall. Command Wire Hooks are quick to remove but stay up well, even with heavier items. I buy the variety pack and find clever uses for them all over the house! I don’t have room in the kitchen for my cookbooks so I keep them organized in a pretty basket under the foyer cabinet. They are still easily accessed and don’t take up precious counter or cupboard space in the kitchen. Before you buy baskets new, check out your local thrift store. 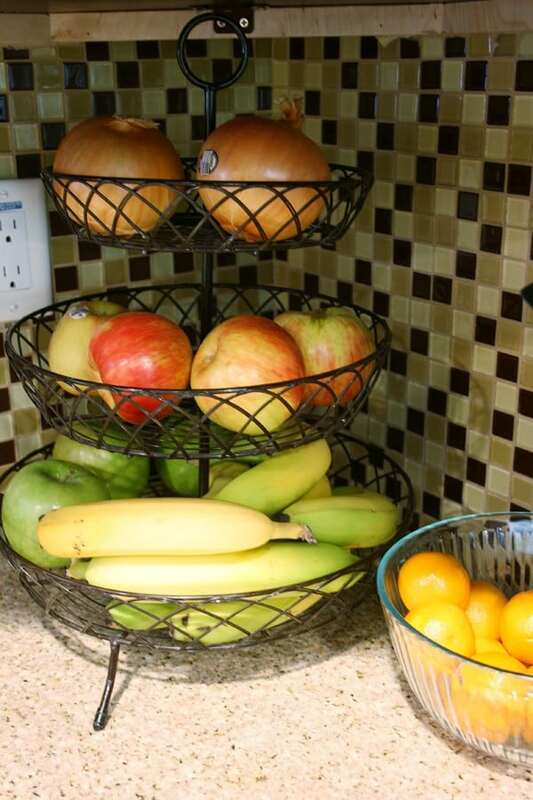 This is a fantastic place to find inexpensive baskets and you can always spray paint them for an updated look. 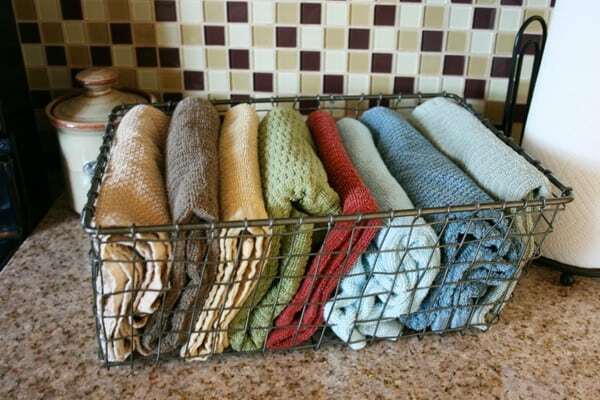 With drawer space at a minimum I keep my clean kitchen towels at the ready by folding them and keeping them within arms reach of the sink in this neat wire basket. I also have Wire Basket Organizers (less than $15 for two on Amazon) like this on the back of the toilet for hand towels. 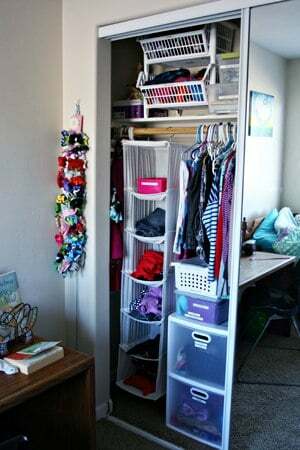 Use individual shelving in the closet to take advantage of tall ceilings. If you can, always go UP and take advantage of the space you have. We have small closets but they have tall ceilings so I bought expandable shelving units. This allows me to safely stack items higher and use up all the space available. Use all the space you can on shelves by maximizing with wire shelving units. 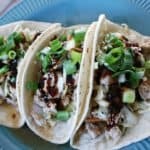 We use these in the kitchen to make use of extra space for plates and bowls. In the pantry for canned foods and boxes this Small Kitchen Helper Shelf really helps maximize space (for about $7 on Amazon). 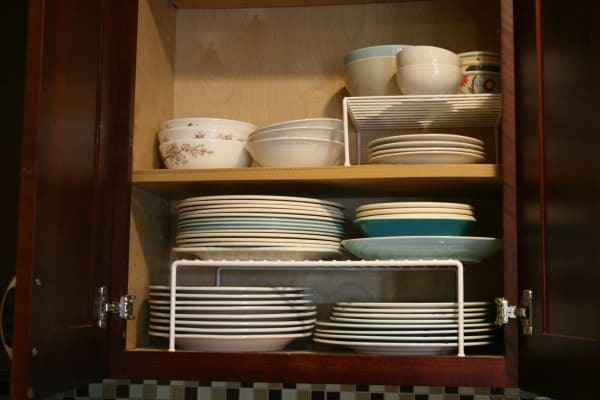 Using wire shelving to make extra space for plates and bowls. LEGOS. Oh yes, my friend. Let’s get all those tiny bits and pieces boxed up so that you only pull them out of the box intentionally when you’re ready to play. We also have Leapster games and the Leapster unit all in one box together. Seasonal clothes and blankets don’t need to take up space in the closet. 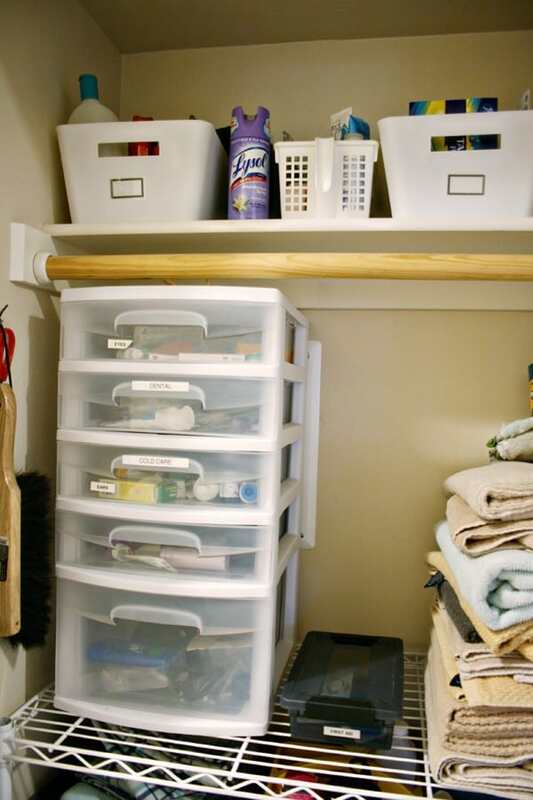 We load up plastic bins or use Ziploc Space Saver bags to store these items in the attic or under the bed. With a new baby, I had been given some wonderful hand-me-downs. I wanted to keep track of what I have so I went through the clothes and placed the sizes together into Clear Storage Boxes . A quick label on the outside of each will let me have the next size up within easy reach. Once she’s used up all the clothes in the bin, I can remove the label and re-purpose the box. The expandable metal shelving unit makes it easy to take out just the one thing you need. Clothing has been organized into boxes for the future. We have a lot of books (I used to work at a bookstore!) but I hated how the small paperbacks were mingling with the tall picture books because they never sat nicely on the shelf together. 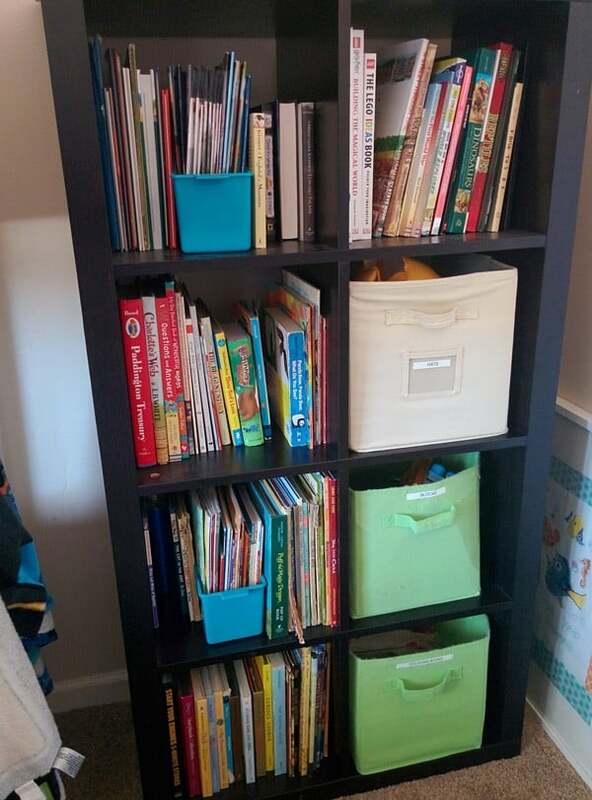 I found these inexpensive plastic Book & Magazine Organizers and they are perfect for holding paperbacks. I use them on the shelf next to the taller books as a sort-of “book end”. 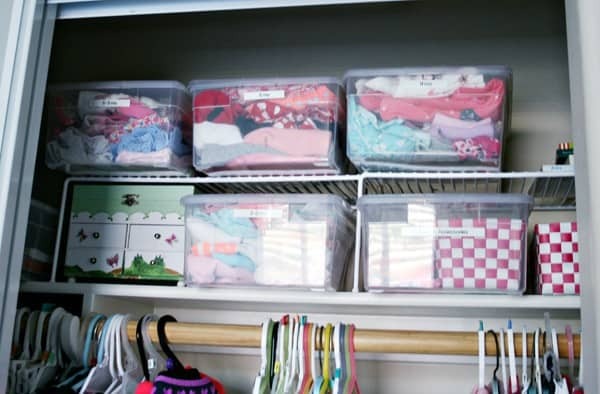 Consider buying bins or boxes to hold other like things, like summer items. 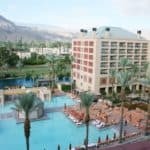 All the bathing suits, sunglasses, and beach hats would then be in one, easy-to-find location. Here, we have one soft bin for hats, one for blocks and one for coloring books. Our bathroom counters are quite small and there’s no room for clutter. 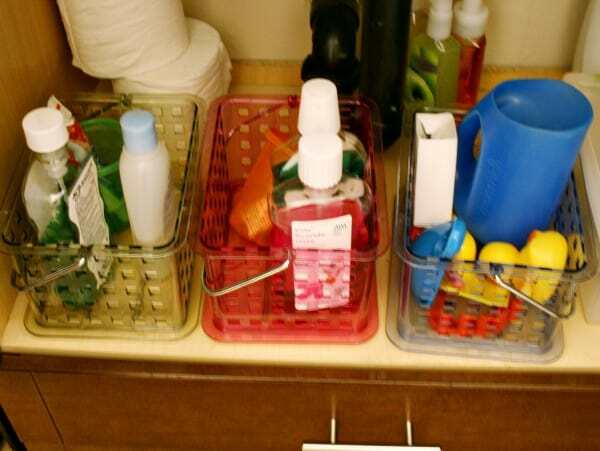 We keep only the soap dispenser and toothbrush holder on the counter (which makes it easier to clean as well). Under the sink, we have a colored container for each child that holds their personal toiletries. Each child’s toothpaste, drinking cup, deodorant, face wash, etc is in their own container. My daughter has a separate bin for her hair brush and accessories. I have two-tiered Mesh Cabinet Baskets under my bathroom sink that holds things like lotion, make-up and razors. One basket holds hair styling products and another large bin holds tools like the blow dryer and flat iron. Target frequently has plastic bins for $3 in their Dollar Spot section. 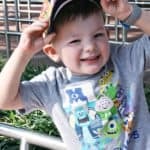 They are nice for items that can be tossed in, like winter hats or gloves, sunglasses or random toys like cars and action figures. Set them on a shelf or even inside a drawer to section off and keep small items (like socks & underwear) from getting lost. In the kitchen, we store breads in a decorative Wooden Crate on the counter. If you don’t want to purchase bins or crates, keep your old shoe boxes and decorate them with wrapping paper for neat and tidy closet or drawer storage. An open bin within a box keeps things organized and contained. BEFORE (left) – Clutter of random stuff on the top shelf. AFTER (right) – Stackable bins hold seasonal items like sun hats and winter wear. 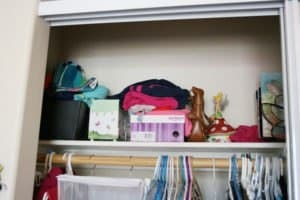 In anticipation of sharing this room with the new baby, I had made bins for art supplies and electronic cords to get my daughter in the habit of putting these items up and out of reach. 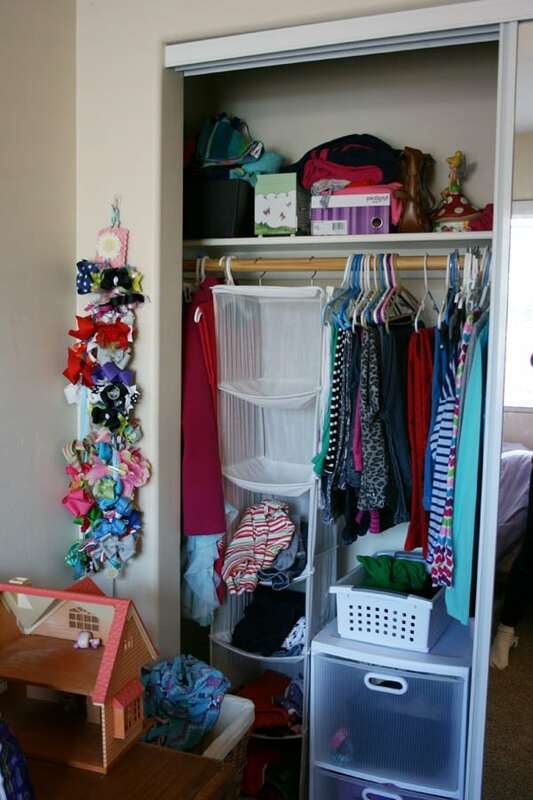 BEFORE (left) – The fabric hanging unit with daily outfits was a good start. I moved the two-drawer unit in to hold pajamas and socks but items like tights, sunglasses, hair accessories and underpants were mixed in and it was hard to find items. AFTER (right) – Rearranged top shelf with addition of bins for seasonal items. Added a small bin to the daily outfit unit so she can choose which accessory matches without having to dig in another larger bin. Deep drawers with pajamas now hold smaller bins for tights, sunglasses and other hair accessories so everything is separated. A separate bin on top of the drawers holds underpants. Whenever possible try to use a space outside of the house, like your garage, storage shed or attic. We simply don’t have the kitchen cabinet space to hold our large slow cooker or stand mixer, so we store them in a cabinet in the garage. Yes, you could keep some items on the kitchen counter but this can create a lot of clutter and makes it harder to properly clean the counter tops. Since we also shop at Costco quite a bit we tend to have a lot of bulk items. Bring in only what you need into the house and store the bulk of it elsewhere. 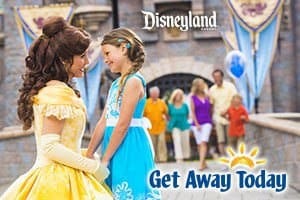 « LEGOLAND California – A New Adventure is Here!